Air pollution is a public health crisis in London with thousands of people dying prematurely due to poor air quality in the capital. London's local authorities are committed to tackling air pollution and are taking the lead in delivering air quality projects but they need support and funding. Read more about what boroughs are doing to tackle air pollution. Since 2016 London Councils has conducted annual research on public attitudes to and knowledge of air quality issues in the capital. In 2018 London Councils produced a guide to the air quality issue in London, Demystifying Air Pollution in London. 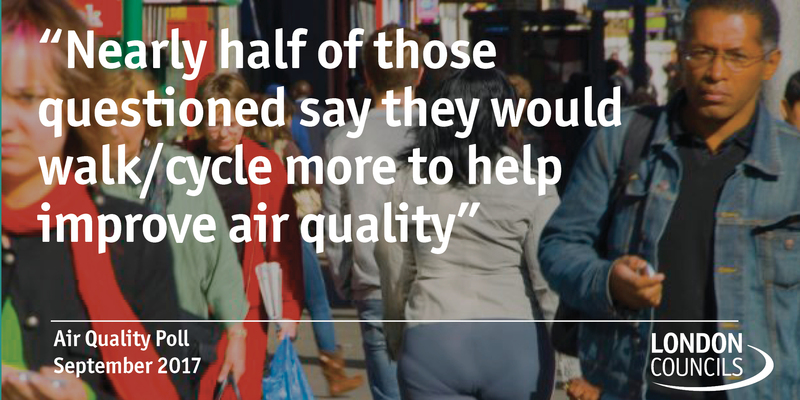 We provide a single voice for London’s local authorities on air quality issues. Our aim is to support London's boroughs to ensure that they have the tools they need to improve London's air quality. We submit evidence to consultations and contribute to policy development research in collaboration with London's boroughs. We are represented on the London Air Quality Steering Group, alongside borough sub-regional lead officers, the Greater London Authority, Transport for London and the Environment Agency. In August 2013, we wrote to the government, along with the Mayor of London, to request it takes additional steps to help the capital deliver further improvements to air quality. The letter represents an emerging consensus about the need for further targeted action to meet EU limit values for nitrogen dioxide and to continue to reduce levels of particulate matter to protect human health and support economic growth. View a copy of the reply to London Councils' and the Mayor's letter from the Secretary of State for the Environment, Food and Rural Affairs. View a copy of the reply to London Councils' and the Mayor's letter from the Secretary of State for Transport. In the summer of 2018 the Department for Environment, Food and Rural Affairs (Defra) launched the consultation into their proposed Clean Air Strategy 2018. The strategy made a number of encouraging proposals in principle - for instance there is a pledge to introduce new air pollution targets in line with the World Health Organisation’s (WHO) more stringent limits, but stops short of adopting the WHO targets themselves. The strategy also includes recognition that local authorities need more legislative support to effectively enforce air quality standards across all sectors and there is a commitment for new air quality legislation. London Councils has repeatedly called for this over the last few years. The detail of these proposals will determine their success. However, there is a lack of commitment in the strategy to ensure local authorities have the financial resources they need to effectively enforce existing and potential new powers. We also feel that the strategy is weak on the issue of road transport emissions, and given that last year’s ‘UK plan for tackling roadside nitrogen dioxide concentrations’ doesn’t go far enough, this would have been a good opportunity to strengthen the proposals made in that document. The Clean Air Strategy and the recently published ‘Road to Zero’ Strategy for transport emissions include some promising ideas, but do not go far enough. For example, neither strategy includes enough focus or detail on encouraging modal shift. Encouraging more people to walk, cycle and use public transport will be crucial if we are to reduce emissions as quickly as possible in London and the UK as a whole. London needs the resources to keep improving our transport networks, in order to encourage people to switch from private car use. Finally, the ‘Road to Zero’ strategy has kept the date for ending the sale of petrol and diesel vehicles at 2040, rather than adopt a more ambitious target date as London Councils has advocated in the past. We called on the government to properly resource local authorities in their work to reduce air pollution. If new legislation is to be introduced, this must include the appropriate funding to be effective. In May Defra published its new draft National Air Quality plan entitled ‘Tackling nitrogen dioxide in our towns and cities’. This is following the UK Supreme Court ruling for a 2nd time that the initial plan was not legally acceptable. London Councils raises concerns with the Defra air quality plan. The plan lacks details of any central government action to address air quality issues, and instead places most of the responsibility on local authorities without providing any commitment or detail around additional funding support. The response re-iterates London Councils’ support for changes to Vehicle Excise Duty (VED) and also suggests changes to company car taxes as well, to disincentivise people from buying the most polluting vehicles. London Councils calls on the government to introduce a new Clean Air Act, to ensure that the UK’s legal pollution limit values match, or improve upon, the EU’s regulations. Our full response can be found here. In November 2015 Defra consulted on draft plans to improve air quality, in response to the recent UK Supreme Court ruling that the UK government needs to deliver a new plan on how to tackle breaches of EU air quality standards. The government should undertake a full review, across departments, of the ways in which it is able to drive improvements in air quality. We suggest that action should be considered in the areas of transport, planning and energy efficiency. The Government must work with other EU Member States to ensure that Euro 6 vehicles are meeting the required emissions reductions in real world driving conditions. A strategic approach to the identification of Clean Air Zones is required. The Government should provide support to reduce emissions related to the existing operations of nationally important infrastructure that is located in London, such as Heathrow Airport. Our response, which can be read here, sets out a series of actions for government. In July 2016 the Mayor of London announced the beginning of a three-phase consultation seeking Londoners on way his proposals to improve London's air quality. The first phase of the consultation was an online survey on general ideas to tackle the issue of air pollution. London Councils set out its views on the ULEZ, diesel scrappage scheme and T-Charge. Our full response can be read here. The second phase was a statutory consultation to introduce the T-Charge, and a non-statutory consultation on the details around the proposed ULEZ. London Councils noted its support for the T-Charge and commented on the details of the scheme, including on the planned exemptions and operating times. Read the full response here. The third phase of the consultation is split into two sections, 3a and 3b. Phase 3a consulted on bringing the start date of the ULEZ forward five months to April 2019. It also sought to strengthen the emission standards to include particulate matter (PM) alongside nitrogen dioxide (NO2). You can view London Councils' response here. The final stage of the consultation focused on the epxansion of the ULEZ beyond the Congestion Charge Zone to the north and south circular roads in October 2021. The consultation also focuses on tightening the environmental standards of the London Low Emission Zone (LEZ) for Heavy Goods Vehicles (HGVs). London Councils support direct action to tackle London's dangerous air pollution, and London's boroughs have been leading efforts on this for years. London Councils supports the principle of a wider Ultra Low Emission Zone, but highlights some concerns with the practicalities of the proposed border. You can view London Councils' full response to the final stage of the Mayor's air quality consultation, here. In September 2015 the Mayor consulted on proposals to implement a new framework for London's local authorities to follow when monitoring and planning actions to improve air quality and reduce exposure. This has the objective of reducing bureaucracy to enable local authorities to focus on taking action. London Councils' response supported this objective but questioned whether all of the proposals were consistent with it. We want to see the Mayor work with those boroughs that consider that the proposal would increase the reporting burden to ensure that it doesn't divert resources away from taking action to improve air quality. Government should prioritise investment for air quality improvement measures in London and the other core cities, to have the maximum impact on the overall UK targets and thus minimise the risk of EU fines. Government should work with local authorities to develop a clear set of agreed priorities and targets including, where appropriate, through retention of Air Quality Management Areas (AQMAs) and Air Quality Action Plans (AQAPs). Government should work with the Greater London Authority and London’s local authorities to develop a London-specific system for air quality management. Government should set out clearly the roles and responsibilities for government departments, agencies, regional bodies and local authorities so that each tier of government knows what they are expected to deliver and duplication of effort is minimised. It also clearly sets out our position regarding the ability of government, under the Localism Act 2011, to transpose European financial sanctions to local authorities, which we believe to be unfair, unreasonable and disproportionate. The response contains a series of case studies highlighting the work boroughs are doing to improve air quality in London. The committee published its report in December 2014. The government responded to it in March 2015.